海浪破坏在整个夏威夷群岛都有报告。120人因伤接受治疗，大多是轻微伤。整个夏威夷大约有500人无家可归。尼豪岛也遭到严重破坏，一项空中调查表明有20间房屋被摧毁，另有160间受损，岛上226位居民均受影响，但无人受伤。在当时，伊娃是在夏威夷造成损失最多的风暴，共造成3.12亿美元的损失。(1982 USD, $7.74億 2019 USD). ^ 1.0 1.1 1.2 1.3 Central Pacific Hurricane Center. 1982 Central Pacific Tropical Cyclone Season. 1982 [2006-12-17]. ^ 2.0 2.1 2.2 2.3 2.4 2.5 2.6 2.7 Mariners Weather Log. Hurricane Iwa. 1983 [2006-12-17]. ^ United States Geological Survey. Summary of Significant Floods, 1982. 2005 [2006-12-22]. （原始内容存档于2008-02-20）. ^ 4.0 4.1 A. T. Dengler, P. Wilde, E. K. Noda, and W. R. Normark. Turbidity Currents Generated by Hurricane IWA. Geo-Marine Letters. 1997 [2006-12-22]. ^ 5.0 5.1 Anthony Sommer. Lessons Learned from Iniki leave officials better prepared for any future disasters. Honolulu Star-Bulletin. 2002 [2006-12-22]. ^ 6.0 6.1 6.2 6.3 6.4 United Press International. One Dead in Hawaii Storm; Damage to 3 Islands Severe. The New York Times. 1982-11-25 [2006-12-22]. ^ United Press International. 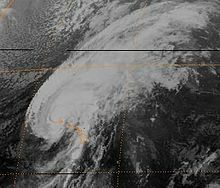 Hurricane Iwa Hits Hawaiian Island of Kauai. The New York Times. 1982-11-24 [2006-12-22]. ^ 9.0 9.1 9.2 9.3 United Press International. Power Still Out in Parts of Kauai. The New York Times. 1982-11-30 [2006-12-22]. ^ United Press International. Hawaii Hurricane Path Declared Disaster Area. The New York Times. 1982-11-28 [2006-12-22]. ^ Eric S. Blake, Edward N. Rappaport, Christopher W. Landsea. THE DEADLIEST, COSTLIEST, AND MOST INTENSE UNITED STATES TROPICAL CYCLONES FROM 1851 TO 2006 (AND OTHER FREQUENTLY REQUESTED HURRICANE FACTS) (PDF): 26. April 2007 [2007-04-11]. ^ Michael Tsai. Hurricane Iwa. Honolulu Advertiser. 2006-07-02 [2006-12-22]. ^ Charles Fletcher, Eric Grossman, Bruce Richmond. Hawaii Hazard Mitigation Forum. 2000 [2006-12-22]. （原始内容存档于2015-02-16）. ^ Atlantic Tropical Weather Center. Tropical Cyclone Retirement. Ablaze Productions, Inc. 2006 [2006-12-23].